Lands filled with beauty beyond all imaginations. Yesterday I spend a wonderful late afternoon walking through the woods down to the Saco River with my English Animist grovemate. We had a very fruitful talk about action, about living our Druidry as compared to practicing our Druidry. In all religions there are theological concepts, rituals and traditions. Once one has thoroughly ingested these, what is left? What is Paganism outside of the seasonal and lunar rites? Outside of the rituals, folk magics, myths, stories, legends, poems, and music? Outside of our traditions? What is at the heart of it all? I practiced a martial arts that had a lot of mystique, cool outfits and unique weapons. It was so cool working out with a group where everyone had a uniform and gear. Over time the mystique wore off and I questioned myself, “What is left when you take all the reference of tradition and the class away, the uniform and the gear?” That is the same question I now apply to my Druidry. When people get involved in Pagan traditions, I think the mystique is something that feeds them on a deep level. They aren’t in Kansas anymore. The incense, smudge, altars, ritual clothing, and all the other mysterious ritual tools, songs, chants, etc. take them to a state of mind that is different from the norm. The goal being to stop and take the time to open our awareness to the sacred, to become aware of our own soul and to sort out where it fails and succeeds in relationship. We find healing. We find connection. Over time this state of being is easier to get to. The tools and ritual aren’t needed. It is a matter of stopping our busy minds and taking a breath. And there we are, in a state of presence recognizing the sacred, finding connection on a soul level to land, the community, and the gods. And then things shift again, we find these periods extend. It isn’t a practice anymore. It is a way of being in the world, every moment. Presence is about the moment, not the activity. I think the goals of Druidry and Zen are very similar. Bobcat once told me not to think of these things are skills but rather as potentialities. I think this very wise. And that simple statement opened some doors in my mind. A skill is about the individual. Potentiality is about relationship. So the conclusion that my grovemate and I came to was that we need to live this. Our spiritual ideals have to be integrated into every activity we do during the day. Time set aside for ritual, celebrating the 8 major festivals, and the moon cycles etc, are important but they can be a distraction from the real point of it all. And the “point”, well that is up to the individual to decide, but for me it is this; to be fully alive, living in the freedom of the moment, finding inspiration through my connection to the land, the community, and the gods. We decided is this; our grove gatherings should not be about taking time out, but rather for doing things, to further engage. We want to have our grove get out and do things, like cleaning up the side of the river where people are dumping trash, helping each other garden or make repairs around our homes. 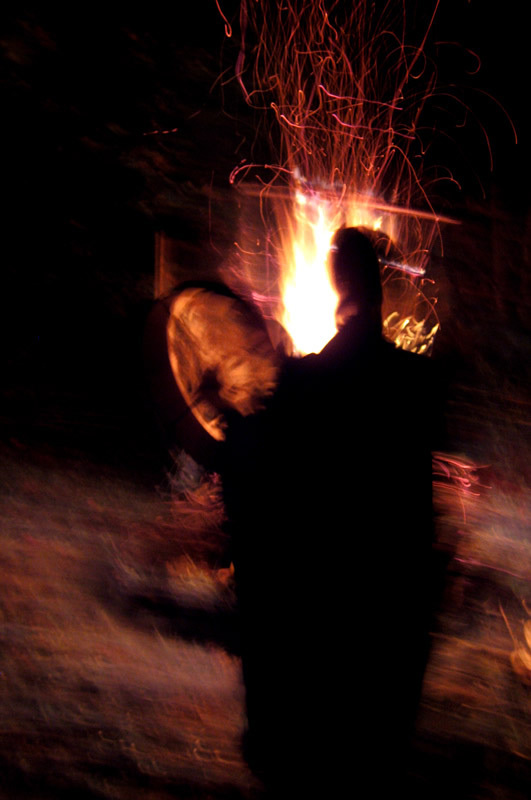 These activities should be every bit as much a spiritual experience as our Samhain rituals. We need to carry this into every activity we do, from corporation to the deep forest. Chop wood, carry water. We have moved past the mystique and more into the heart of our paganism. It is time for our practices and expressions to shift with this new paradigm. I watched a red wing black bird this morning and wondered at the magnificence of its life. It is living completely integrated into Nature. There is no separation between its spiritual ideal and that way it lives in the world. That is what I am working towards.